We recently went on a vacation to Boston and Cape Cod, and I fell head over heels for the charming architecture in Cape Cod. Oh my word, so many hydrangeas! But that was just the beginning of the appeal. I'm going to write up a few blog posts this week about the many beautiful things we saw on our trip and how they have inspired me to think differently about our house. 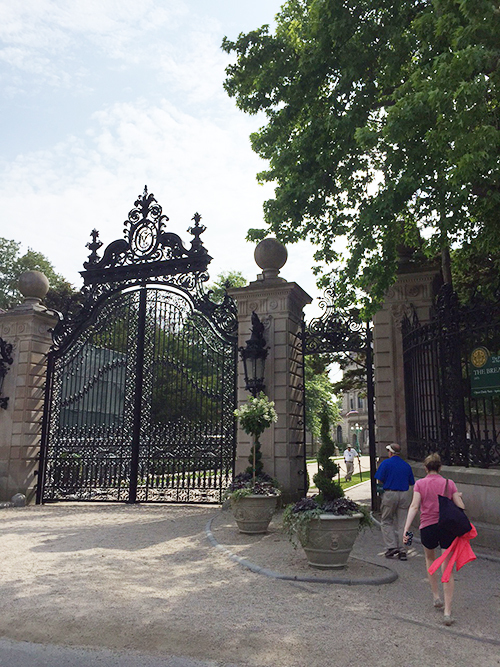 First we took a day trip from Boston to Newport, Rhode Island, to explore and admire some of the extravagant mansions that have made that town famous over the years. 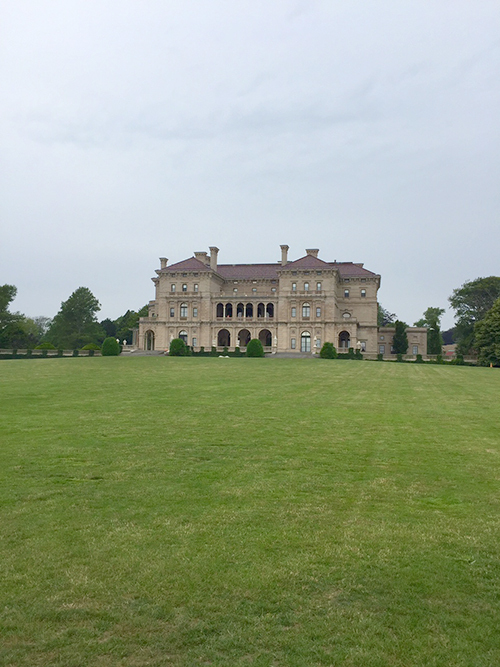 My favorite was The Breakers, summer home to Cornelius Vanderbilt, II and his family. It has more than 70 rooms and it was just a summer home. Can you even imagine? How's this for an entrance? It's perhaps the biggest gate I've ever seen in my life. I'll be honest: I pretty much hated the interior of the house, at least in terms of style. It's completely over the top and certainly not my cup of tea. If you're wondering what I mean, check out these images of the interior on the mansion's Pinterest page. (They don't allow us to take photos inside.) 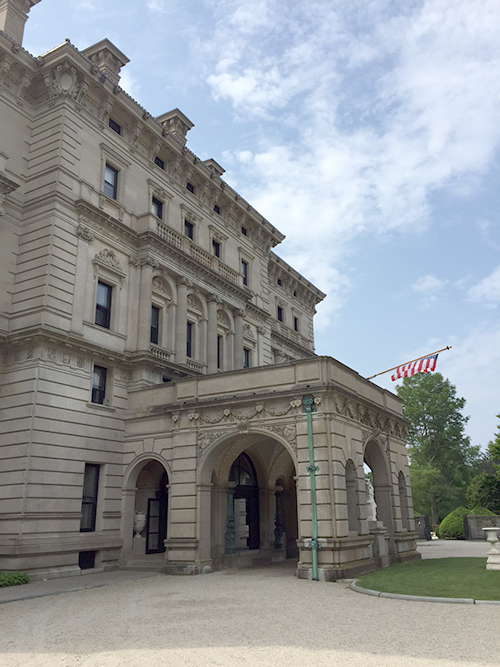 It was built during The Gilded Age, when more was more. It was just too much! However, the home had some major redeeming qualities. For example, how's this for a backyard? 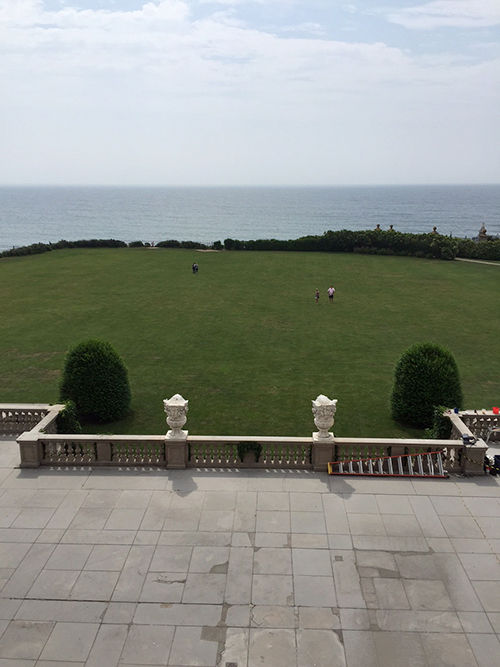 What kind of extravagant parties must have been hosted on this amazing terrace? 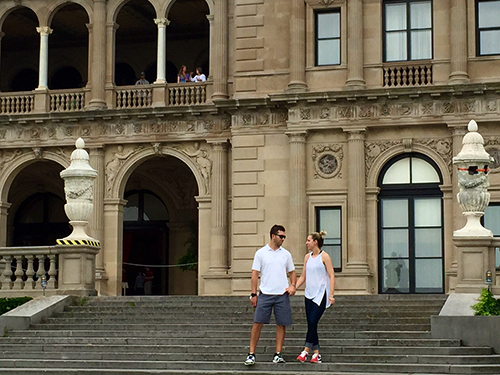 It's fun to imagine the who's who of American royalty standing here on the balcony with a glass a wine, admiring the view. 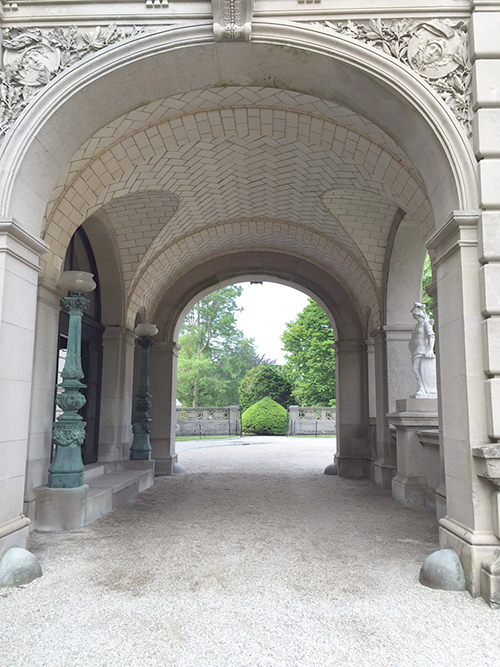 Who parked their motor coach under this elaborate porte-cochere? I'm in love with that ceiling detail. My favorites parts of the house, by far, were the kitchen and butler's pantry. It's a little ironic because I'm sure the Vanderbilts turned their nose up at those rooms because they were part of the servants' domain, but I was blown away by how gorgeous they were. This kitchen was built in 1895, but it's remarkable to think about how many pieces of this kitchen are very much in style today: the two-tone cabinets, the copper accents, the subway tile, the cabinet hardware, the open shelving. How many people would kill for that amazing island in their home right now, 120 years later? The butler's pantry is another amazing "wow" moment with two stories of floor-to-ceiling cabinets filled with china and everyday dishes. The craftsmanship is beautiful. The huge farm tables in the middle would be at home in any Pottery Barn catalog. 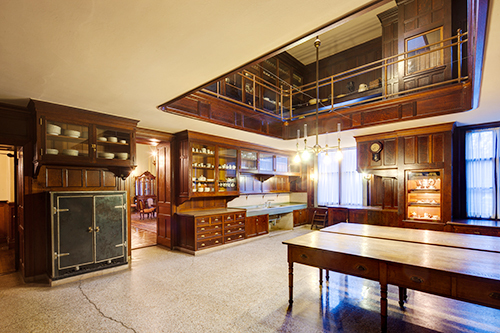 I think it's so neat to think about the history of this kitchen and butler's pantry. As an avid Downtown Abbey fan, I immediately pictured the servants working away on a fancy Christmas dinner in this kitchen, with Mr. Carson polishing silver in the butler's pantry. What are your favorite parts? In my next post I'll share some of my favorites from Martha's Vineyard, which was just as dreamy as I expected.